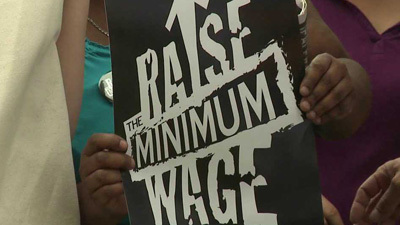 The San Diego City Council will consider today whether to pass an ordinance or put forth a ballot measure to increase the city’s minimum wage and provide earned sick days for local workers. Since the last time I wrote on this subject in late April, the original proposal of raising the minimum wage to the local Self-Sufficiency Standard of $13.09 with five earned sick days has been significantly lowered in order to address the concerns of opponents. The current proposal keeps the initial five earned sick days but now only raises the minimum wage to $9.75 in 2015 and $10.50 in 2016 before stopping at $11.50 in 2017 and indexing it to inflation after January of 2019. Thus, despite the fact that the original proposal fell short of the landmark $15 an hour passed in Seattle and being fought for elsewhere around the country, the City Council still bent over backwards to appease the fears of those clamoring that any increase in the minimum wage would spell disaster for small businesses and the local economy. And they did this even though the preponderance of evidence shows that minimum wage increases elsewhere have actually helped the economy. The response to this compromise from the Chamber of Commerce and company was to essentially flip the Council the bird and reaffirm their opposition to any measure that moves beyond the state’s minimum wage. As Doug Porter observed at the time, “San Diego’s downtown reactionaries believe they are in control” so nothing other than total surrender will satisfy them. Hence, rather than entertaining any more compromises with themselves, the Council should hold the line and do the right thing without watering down the proposal any further. Simply put, it’s time to stand on principle and do the right thing for San Diego’s low-wage workers. 1) Provide for five earned sick days to nearly half of San Diego’s private sector workers who lack them. Given the fact that restaurant workers and childcare providers are the most likely to lack access to earned sick days, this part of the proposal does not just do right by local workers but helps protect the public’s health by making it less likely economic necessity will force folks who need the money to show up to work sick and share their illnesses with the rest of us. Giving workers earned sick days also means they are far less likely to send sick children to school or stay ill longer for lack of recovery time. In the final analysis, having earned sick days makes workers more productive, reduces emergency room visits, keeps sick kids out of school, and consequently helps the economy and the community at large. The Great Recession continues for many San Diegans. The share of households living below the Self-Sufficiency Standard has grown from 30% in pre-recession 2007 to 38% in 2012, the most recent year for which all data are available. That’s an increase of 71,472 households struggling to get by. In short, San Diegans making the current minimum wage are struggling just to get by. They can’t afford rents, transportation costs, childcare and a host of other basic necessities. Raising the minimum wage to a little bit below the local Self-Sufficiency Standard is the least we can do. It’s not enough, but it is a start. 3) Help the local economy. When low-wage workers get raises, almost all of that money gets pumped back into the economy at local businesses and that increase in consumer spending leads to more tax revenue. That increased tax revenue will provide more funding for infrastructure and other pubic services. In sum, raising the minimum wage is a win-win for all of us. So who could be against it? The elephant in the room in this debate is the fact that those who are opposed to this imminently reasonable compromise proposal just don’t want to do anything that will help low wage workers because they are fine with the way things are now. As I’ve argued here before, they are proponents of a new Social Darwinism that ignores the facts and desperately seeks to maintain the economic status quo even as Thomas Piketty’s work has decisively exploded the myth that anything other than crisis or political intervention can address our dangerous level of economic inequality that has much less to do with education, work, and merit than it does with the trend toward patrilineal capitalism. Hence if it is true that the best way by which one can judge any community is how it treats its weakest members, then this Council vote is a basic test of the character of San Diego. Are we the kind of city where folks like the students I teach at City College who struggle everyday to feed families and/or put themselves through school matter? Or are we the kind of city where those with the most gold always rule, no matter the merits of the proposal or the clear moral imperative to do right by our fellow citizens on whose labor we all depend to help keep our city running? Tonight we will find out. You just don’t get it. Any raise in the minimum wage will only give the people who work for it a boost for just a short time. Then when it rolls through all the unions and they get their raise which is part of most of their contracts, prices will rise and the minimum wage worker if they still have job will be back with comparable pay to what they had before. The real hurt will be the people on fixed income and maybe got a one percent raise last year. If raising the minimum wage was the answer than why not raise it to fifty dollars an hour. Bob, it appears that you “just don’t get it”. Your predictions of catastrophe if there is “any raise in the minimum wage” just don’t stand the cold reality of our economic times. What happened to go to school to get a better job? why should small business be the one to “Raise up the Poverty Level”? I would love to ask the supporters of this how they would feel if the money had to come out of THEIR pockets? I bet they wouldn’t be so quick to help! I started at 4.25 an hour 20 years ago, and today I make considerably more than that, because I worked two jobs and went to school for a trade, it is called the AMERICAN DREAM–not The AMERICAN HANDOUT. I don’t think minimum wage workers are the weakest members, what about our homeless? The wage is an entry level wage, there will be no reward for loyalty or longevity, when a person walks in and makes effectively 24K a year, from McDonalds, wow–why go to college? The money DOES come out of our pockets, in the form of government assistance to people whose poverty level wages are not enough to survive. It’s the same as if we just gave our tax money to the billionaires that own the companies that pay the poverty level wages. Minimum wages stay in the local economy and benefit the local populous. The minimum wage is a joke. Who is against it? Everyone whose cost of living increases. There’s a popular myth that prices will increase if the minimum wage is raised, based on the false premise that prices are based on costs. Prices are based on market; the price for any good or service is the maximum the seller believes he can get for the good or service, no relation to cost. Availability is based on cost; if the good or service cannot be produced and delivered at a profit, it will become unavailable, and the more profitable it is, the more available it will become, until competition drives the prices back down again. This is how the market works, and how it’s intended to work. The big losers in a minimum wage hike are the billionaires. Currently, we as taxpayers make up the difference between what people need to make to survive, and what the billionaires pay them. That’s the same as just giving the billionaire that money. Raise the minimum wage, and the billionaire will be forced to pay his employees enough that our taxes are no longer required to support that employee.